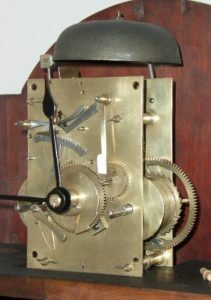 Georgian period Dublin longcase clock by Gaskin of Dublin. Beautiful flame mahogany case with Grecian urn inlay to trunk door. Domed hood with rope edge feature and with original wooden finials. 12″ round painted dial signed Gaskin – Dublin. 8 day movement striking on a cast bell and has original cast iron weights. 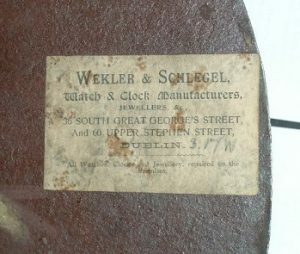 Three generations of the Gaskin family operated as clockmakers in Dublin from 1725. The firm of Gaskin & Co. was established in College Green in Dublin in 1797. 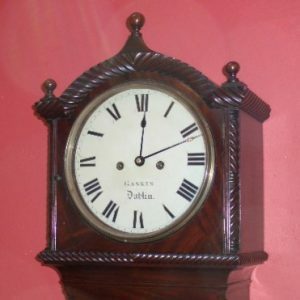 This clock would date to around 1820. Fully restored with one years guarantee. Ref: h8360.